At the Maine Wildlife Park in Gray, the biggest star is a little moose. 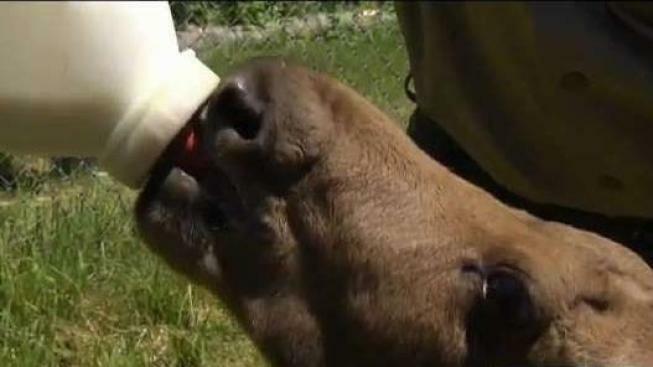 A 22-day-old, 27 pound calf named Maggie the moose can be viewed three times a day at the wildlife park where she is getting rehabilitated after being rescued in northern Maine. "We definitely see a change in our attendance," said Park Superintendent Curt Johnson. "Maggie is going to serve as an ambassador for her species. Just by being here, she will educate a lot of people." Before she was drawing big crowds, Maggie was getting a lot of clicks online. Earlier this month, Shannon Lugdon heard Maggie crying and saw her wandering on her property in Wallagrass, Maine. "We've been taught from a young age that you don't interfere with babies, but mama moose never came back." said Lugdon. Worried about the abandoned newborn, they called wildlife biologists, who responded within minutes. They tried to move Maggie close to a brook, hoping her mother would eventually come for her. Lugdon said her family noticed Maggie walking close to traffic and had to direct her back to the brook. Soon after that, the family dog noticed her. "Leo wanted to investigate, sniff at her, and lick her bug bites," said Lugdon. "She responded really well to him." Ludgon took photos and videos of Maggie and Leo bonding, and they went viral. While the moose fit right in with the family, they knew she would be better off under the care of professionals. She was taken to the wildlife park, where she is growing fast and strong. While the Lugdon's live nearly 300 miles north of Gray, they have already visited Maggie once and plan to visit her a few times this summer. "She's part of our family," Lugdon said. Biologists say the little moose could grow up to 800 pounds. Depending on her progress, she may live at the Maine Wildlife Park permanently. The public can watch Maggie bottle feed and play in her pen three times a day: at 10 a.m., 2 p.m., and 5:30 p.m. when the Wildlife Park is open.